The zebra spider, also known as the zebra back spider, is a species of jumping arachnid found across the Northern Hemisphere. It gets its name from the black and white stripes on its body. 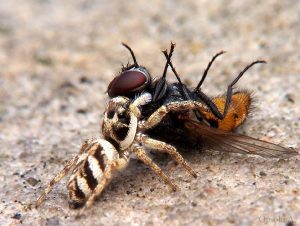 Although it is a poisonous insect, its venom does not have enough strength even if it bites a human. Size: Males are 0.20-0.24 inches (5-6 millimeters), and females grow to be around 0.20-0.35 inches (5-9 millimeters). Color: They have a black body with shiny stripes of white hairs. These jumping spiders are common throughout Europe, North America, Britain and, northern Asia. 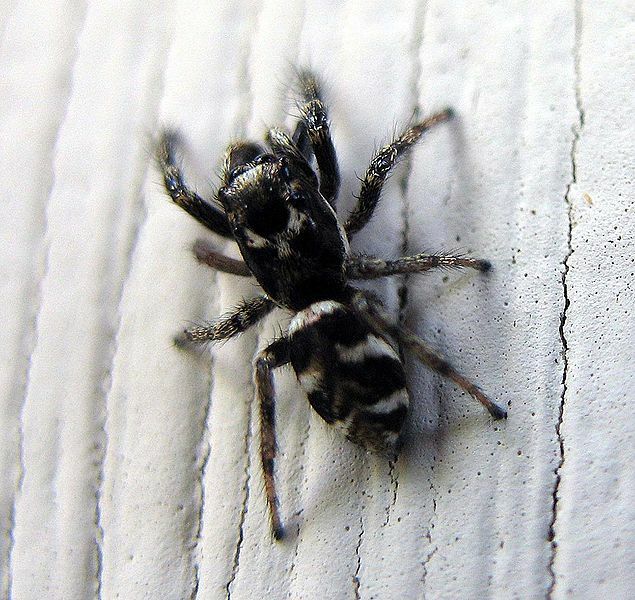 Zebra spiders live near human populations. They are commonly seen on fences, walls, and window sills. They also inhabit meadows, gardens, and forests. They are a terrestrial species. These spiders lead a solitary lifestyle. They are among the few spider species that do not build webs. Zebra spiders are diurnal and hunt during the daytime. They feed on insects and have been seen hunting on mosquitoes and flies much larger than them. They locate their prey with their front eyes, and then meticulously stalk them, before moving in close enough to pounce. 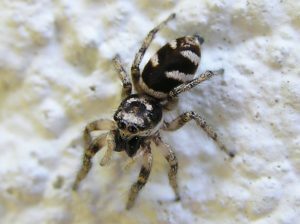 The mating season for zebra spiders is in spring and early summer, and they breed once a year. Before mating, males perform a courtship dance that involves waving its front appendages (exclusive to males) called pedipalps and moving its abdominal region up and down. If the female likes the dance, mating occurs, which involves the male transferring sperm into the female organ known as epigyne. Females guard the hatchlings, and after the latter go through their second molt, they become independent of their mothers and live by themselves. 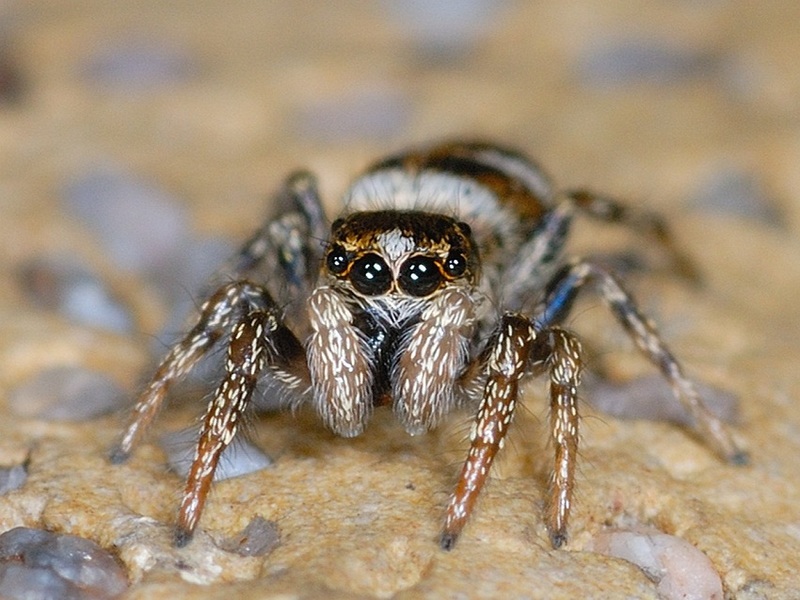 Male zebra spiders reach sexual maturity before the females. Information regarding the lifespan of these spiders in their natural environment is limited. However, they live for around 2 to 3 years in captivity, with females outliving males. Zebra spiders communicate through visual, olfactory, chemical stimuli. They also use vibrations to perceive their environment. 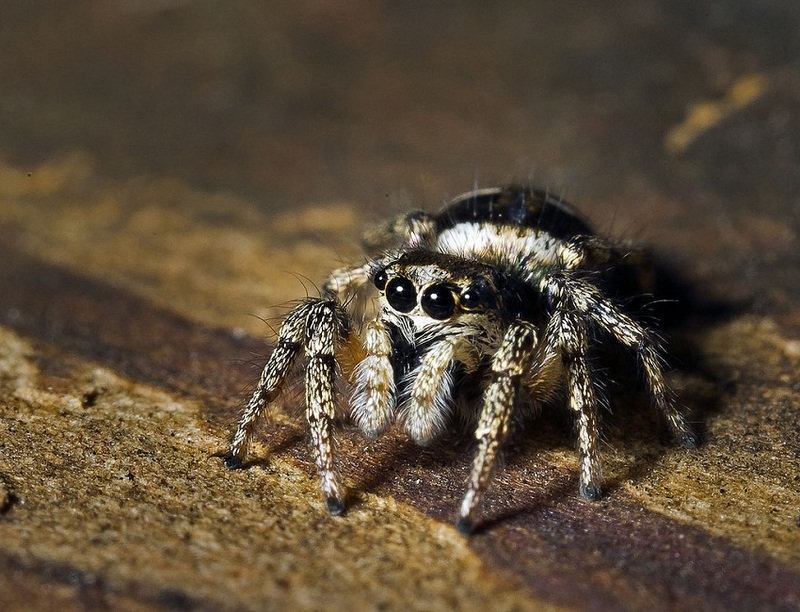 The zebra spider is believed to have the best eyesight in the insect world, with four large forward facing eyes that give it excellent stereoscopic vision. 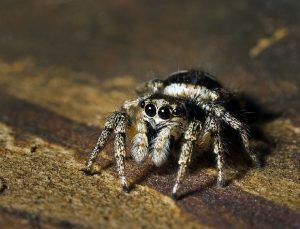 The remaining four eyes are arranged in such a way that allows the spider to see around its body. This aids them both in catching prey and escaping predators. They can jump as well they can by straightening the fourth, rearmost pair of legs suddenly. The velocity of the jump is estimated to be around 2.1-2.6 feet/second (0.64-0.79 meters/second). The coloration of these spiders helps them stay camouflaged. Mantises and spider wasps are known to prey on zebra spiders. 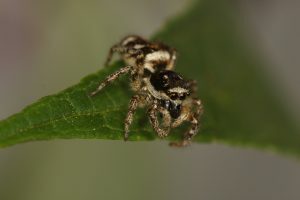 The IUCN is yet to assess the zebra spider. 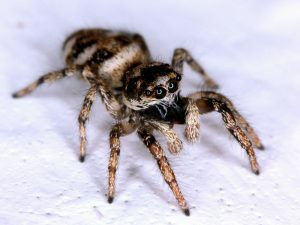 Their scientific name is a mixture of the Latin word ‘Salticus’ which means dancing, a reference to the zebra spider’s agility, and the Greek word ‘scenicus,’ meaning a decorative place or theatrical, referring to the showy coloration. They are one of the few insects that show human awareness. If someone looks at them, they often raise their heads, and their behavior changes as well.